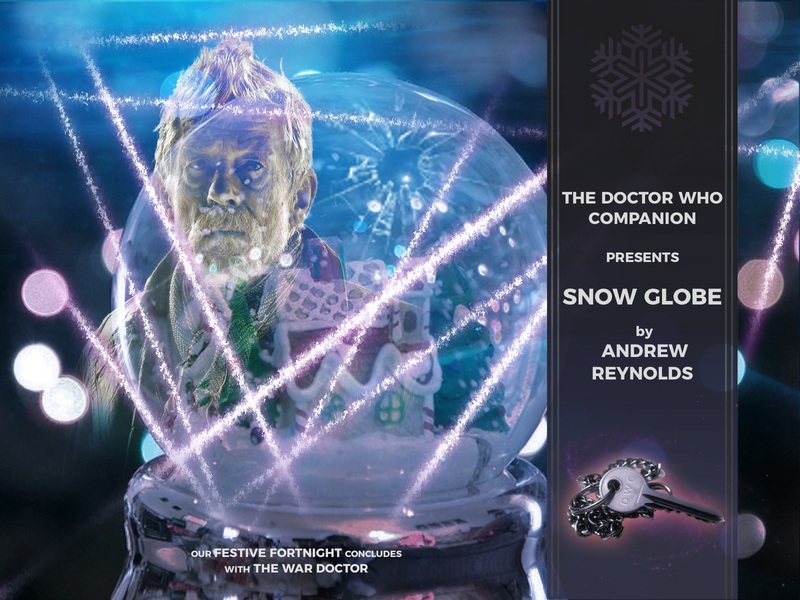 Friswell stretched out an arm to present the pristine village to the disbelieving eyes of the Doctor, and cried, “A snow globe at the bottom of the ocean!” Just below them at the foot of a hill, stretched row after row of identical gingerbread style houses each with a fir tree in their front gardens. “This is something indeed!” said the Doctor as he knelt to pinch a handful of snow between his fingers. “Extraordinary, you’ve redecorated, I actually don’t mind it. That’s a new sensation. 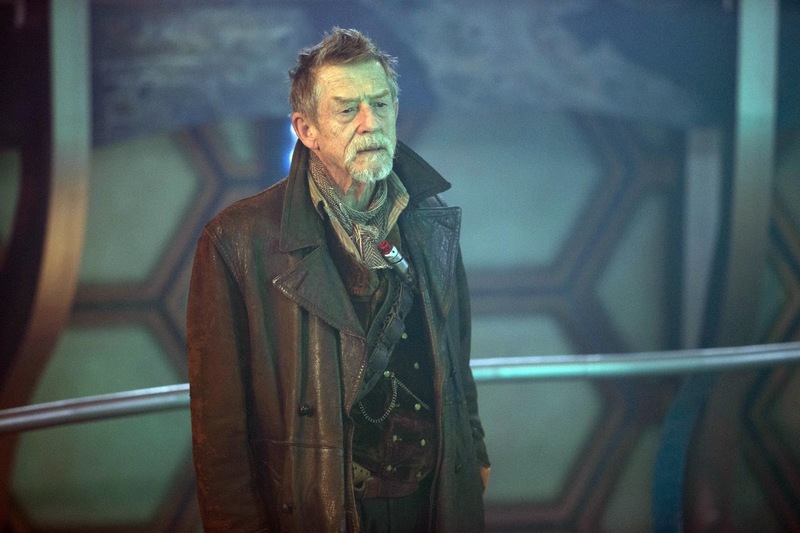 And I take it, you’re the caretaker?” murmured the Doctor as the snow turned to droplets in his reddened fingers. The mark he had left was the only blemish in the snow he could see for miles around him. “And what is that?” he said. “What’s what?” said Friswell, looking around him for what had attracted the Doctor’s attention. “Under the fir tree…” he said, rising to feet as he crunched a path towards what appeared to be a collapsed snowman. 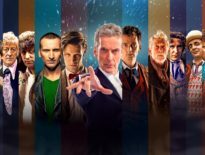 The Doctor stood before the mound and, delving into his worn jacket pocket, removed his sonic screwdriver; whizzing the device over the snow, he stared at the readings with disapproving eyes. Friswell felt an unease creeping up his spine as he approached him. “Doctor, I really think we should get to the matter at hand,” he said. “Oh, I think we just have…” The Doctor said to himself. “Just a snowman,” said the Doctor as he returned the screwdriver to his jacket. The news seemed to please Friswell, who running a hand through his blonde hair, turned back towards the village. “Yes, just a man buried under some snow,” said the Doctor. Friswell spun around, dropped to his knees and began clawing at the snow. Beneath lay a large, now rather blue man, dressed in a suit and jacket. Underneath his hand lay a rather large hexagonal tin which even in death he clung to tightly. “Who could have done this?” cried Friswell. “The list of suspects is rather small, don’t you think?” smirked the Doctor. “Now listen here!” spat back Friswell. “Oh, I know it wasn’t you. Well, not directly at least. It’s really rather simple when you think about it… Open it,” said the Doctor, gesturing towards the tin next to the body. Friswell bent down and, brushing the remaining snow away, he wrapped his arm around the tin, pulling the lid off. Peering inside, Friswell suddenly seemed more confused than ever. The Doctor smiled and began to walk away from the body. Looking up at the artificial sky above, he could just make out the curvature of the glass dome protecting them from the gallons of sea water beyond. “I have a lot of sins,” he said as he slowly began to walk back up the hill. The Doctor smirked; he seemed to look beyond Friswell, who, suddenly aware he had gained the confidence to question him, was doubly aware that it had now abandoned him again. The Doctor knew! He knew everything. “Quite,” said Friswell, trying to steady his nerves. “We wanted the carbine…” he said gloomily. 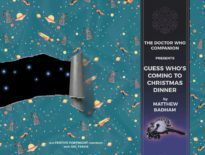 The Doctor could see the TARDIS now sat in the garden of one of the abandoned houses; he delved into his pocket and removed the key; turning back towards the chasing figure of Friswell. Friswell stood before the threshold, listening to a distance whirl of unknowable machinery beyond. He looked the Doctor in his eyes and suddenly saw the pain of forever chasing an ideal in trying times. “Doctor, is this as good as it gets?” he said. The Doctor considered the question, weighing up the implication of condoning anything the men had done. He knew the armada were hours away from destroying the dome forever, wiping any trace of the Doctors attempt to remind himself that he’s still capable of doing good – even when in doing so, he somehow lost a part of himself. “We survive. And we learn. That’s enough for now,” he said as he walked into the TARDIS.